BACKGROUND: Obesity has a well-established, but incompletely understood, link with poorer outcomes from breast cancer . Contributing to this lack of knowledge is a dearth of physiologically accurate ex-vivo platforms to study breast cancer treatment. Recent studies have provided preliminary evidence that adipose tissue is a drug-metabolizing organ capable of protecting leukemia cells from a variety of chemotherapeutics, including anthracyclines [2,3]. Most recently, this same group has provided evidence that adipocytes actively sequester daunorubicin and metabolize it to its inactive metabolite, daunorubicinol . These studies were limited by several factors, including the use of a 2D culture model and the use of commercially available pre-adipocyte cell lines. Herein we use an engineered biomimetic platform derived from patient specific breast tissue which recapitulates the breast tumor microenvironment with a much higher degree of fidelity to investigate the metabolic interactions between cancer cells, patient-derived adipocytes, and the anthracycline doxorubicin. METHODS: Breast tissue acquired from patients was processed in order to isolate mature adipocytes, stromal cells, and breast organoids. These were co-cultured in a 0.6% type I collagen hydrogel to create a biomimetic bulk. Two breast cancer (BC) cell lines (MDA-MB-468, MDA-MB-231) were studied. Each breast cancer cell type was encapsulated in our biomimetic hydrogel at a density of 200,000 cells/mL and plated onto 96 well plates for high throughput analysis. BC in plain collagen and biomimetic hydrogel without BC served as control groups. Cells were cultured for 24 hours before undergoing doxorubicin applications at 0, 0.001, 0.01, 0.1, 1, and 10 uM doses. Samples were fixed at 3- and 6-day time points, stained, and fluorescently imaged using a Zeiss 880 confocal microscope. Image analysis was performed using Imaris™ software. RESULTS: Increased BC cell death was observed with increasing doxorubicin doses. 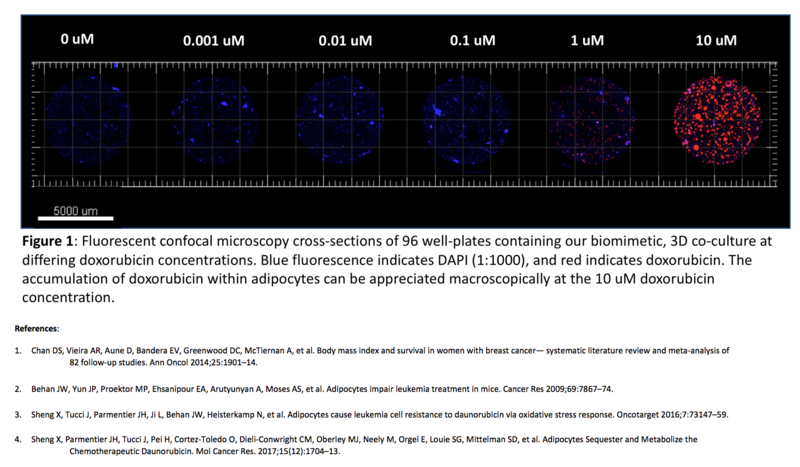 Fluorescent confocal microscopy demonstrated substantial doxorubicin uptake by adipocytes in a manner that was proportional to increasing doxorubicin concentrations (Figure 1). This imaging was not observed in controls without adipocytes. CONCLUSIONS:We demonstrate, for the first time in a high fidelity three dimensional model that recapitulates the breast tumor microenvironment, that doxorubicin becomes concentrated within resident adipocytes. These findings highlight the possibility that individual patient responses to chemotherapy may not only be a result of the nature of their specific tumor, but the metabolism of the drug by non-tumor cells within the tumor microenvironment. This biomimetic, ex-vivo breast microenvironment enables us to study breast cancer-adipocyte interactions in a much more physiologically accurate model.